A coalition of Advocates, Educators, Employers, Employment Service Provider Agencies, Family Members, State Agencies, University Centers for Excellence on Developmental Disabilities, Youth and Young Adults are working together to move Arizona to an Employment FIrst state. A dedicated website for AZ Employment First is currently under construction and will be available in the near future. Employment First encompasses the belief that community-based, integrated employment should be the primary day activity for working age youth and adults with disabilities. It supports an overarching goal that eligible persons with disabilities will have access to integrated work settings most appropriate for them, including the supports necessary to help them succeed in the workplace. Employment First does not mean employment only and does not deny individual choice, but is intended to increase employment opportunities for individuals with disabilities. Why Employment First in Arizona? In 2014, only 22% of people in the DDD system receiving day services were in integrated employment. In 2014, only 14% of DDD funding spent on day and employment services went to integrated employment. People who work have a higher quality of life, greater community participation, and are more likely to make their own choices in life. New regulations from the Centers for Medicare and Medicaid, Department of Justice and the Department of Labor are requiring states to prioritize integrated services for everyone who has a disability. Employment First is a national initiative that promotes competitive employment in an integrated setting at minimum wage or higher, as this is the preferred outcome for people with disabilities. Arizona would like to champion this initiative by implementing its common vision in this state. 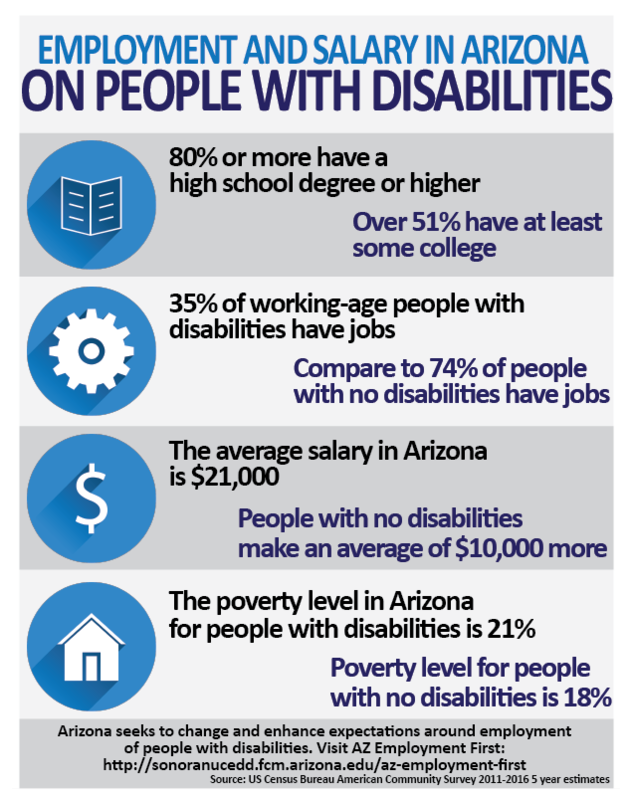 Arizona seeks to change and enhance expectations around employment to promote progressive change in the support infrastructure, which will enable people with disabilities to pursue employment opportunities and achieve economic independence. In October, 2013, stakeholders convened to facilitate an Employment First discussion. During that meeting, a report was commissioned, which provided an overview of Employment First initiatives and highlighted lessons learned from existing Employment First states. During the meeting, an agreement was made to move forward with development of an Arizona Employment First strategy. In January, 2014, an Employment First Core Team comprised of advocates, family members, service providers, educators, state agencies, and the University Centers for Excellence in Developmental Disabilities, was created to help guide the planning process. As such, monthly meetings were held; a communication plan was developed; an informational webinar was presented; and six community forums were conducted to gather information from additional stakeholders. The community forums generated a wealth of ideas, recommendations, and suggestions to help move Employment First forward. Input has been archived and is available for review. In addition, a list of participants, organizations represented, and details of the planning process are contained in the Arizona Employment First Community Forum Findings. Since the public forums, monthly meetings continue(d); an Employment First Strategic Plan was developed and is being implemented; collaborative partnering between the Sonoran UCEDD and RSA developed a position to lead the efforts in moving the initiative forward; an Employment First website is being developed; sub-committees have formed; and the cross-stakeholder collaboration continues, including a fully executed Memorandum of Understanding (MOU) signed by all parties involved, committing to continuing to work together to make the necessary changes in Arizona to increase employment and community opportunities for individuals with disabilities. Who is Involved in Arizona Employment First? Advocates, Educators, Employers, Employment Service Provider Agencies, Family Members, State Agencies, University Centers for Excellence on Developmental Disabilities, Youth and Young Adults. Arizona is an Employment First State!